In terms of U.S. fruit consumption, blueberries rank only second to strawberries in popularity of berries. Blueberries are not only popular, but also repeatedly ranked in the U.S. diet as having one of the highest antioxidant capacities among all fruits, vegetables, spices and seasonings. Antioxidants are essential to optimizing health by helping to combat the free radicals that can damage cellular structures as well as DNA. We recommend enjoying raw blueberries, because, like other fruits, raw blueberries provide you with the best flavor and the greatest nutritional benefits. After many years of research on blueberry antioxidants and their potential benefits for the nervous system and for brain health, there is exciting new evidence that blueberries can improve memory. In a study involving older adults (with an average age of 76 years), 12 weeks of daily blueberry consumption was enough to improve scores on two different tests of cognitive function including memory. While participants in the study consumed blueberries in the form of juice, three-quarters of a pound of blueberries were used to make each cup of juice. As participants consumed between 2 to 2-1/2 cups each day, the participants actually received a very plentiful amount of berries. The authors of this study were encouraged by the results and suggested that blueberries might turn out to be beneficial not only for improvement of memory, but for slowing down or postponing the onset of other cognitive problems frequently associated with aging. New studies make it clear that we can freeze blueberries without doing damage to their delicate anthocyanin antioxidants. There’s no question about the delicate nature of many antioxidant nutrients found in blueberries. These antioxidants include many different types of anthocyanins, the colorful pigments that give many foods their wonderful shades of blue, purple, and red. 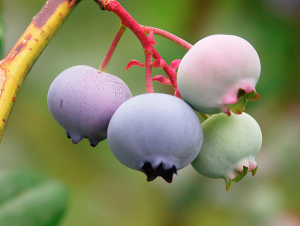 After freezing blueberries at temperatures of 0°F (-17°C) or lower for periods of time between 3-6 months, researchers have discovered no significant lowering of overall antioxidant capacity or anthocyanin concentrations. Anthocyanins studied have included malvidins, delphinidins, pelargonidins, cyanidins, and peonidins. These findings are great news for anyone who grows, buys, or picks fresh berries in season and wants to enjoy them year round. They are also great news for anyone who has restricted access to fresh blueberries but can find them in the freezer section of the market. Berries in general are considered low in terms of their glycemic index (GI). GI is a common way of identifying the potential impact of a food on our blood sugar level once we’ve consumed and digested that food. In general, foods with a GI of 50 or below are considered “low” in terms of their glycemic index value. When compared to other berries, blueberries are not particularly low in terms of their GI. Studies show the GI for blueberries as falling somewhere in the range of 40-53, with berries like blackberries, raspberries, and strawberries repeatedly scoring closer to 30 than to 40. However, a recent study that included blueberries as a low-GI fruit has found that blueberries, along with other berries, clearly have a favorable impact on blood sugar regulation in persons already diagnosed with type 2 diabetes. Participants in the study who consumed at last 3 servings of low-GI fruits per day (including blueberries) saw significant improvement in their regulation of blood sugar over a three-month period of time. (Their blood levels of glycosylated hemoglobin, or HgA1C were used as the standard of measurement in this study.) It’s great to see blueberries providing these clear health benefits for blood sugar regulation!